Zion Market Research has published a new report titled “Hydroponic Vegetables Market by Type (Spinach, Tomatoes, Peppers, Lettuce, Cucumber, and Others), by Distribution Channel (Unorganized small stores, Grocery stores, Hypermarket or a Supermarket, Whole food and Specialty stores, Distributors, Bulk suppliers, and Others), and by Origin (Conventional and Natural & Organic): Global Industry Perspective, Comprehensive Analysis and Forecast, 2017 - 2024”. 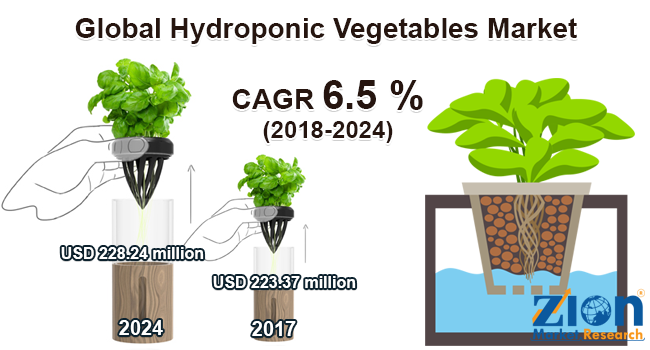 According to the report, the global hydroponic vegetables market accounted for USD 223.37 million in 2017 and is expected to reach USD 228.24 million by 2024, growing at a CAGR of around 6.5 % between 2018 and 2024. Hydroponic crops also include food crops and other decorative crops such as flowers, but mostly hydroponic crop growers have started to grow decorative crops besides edible crops. The global hydroponic vegetables market is projected to enhance the growth over the forecast period due to increasing demand from the food industry. World food demand is increasing rapidly, around 2 lakh people are added to the population that affects the hydroponic vegetables resulting in increasing demand for the food. In addition, 10 to 16% of the crop is eaten by farm animals in search of food in such case the hydroponics provides an effective solution. Hydroponics has high yield than traditional agricultural method. It also provides higher yield with lower inputs without compromising on safety and quality of food. The hydroponic harvesting is controlled by the special system which performs functions like monitors the humidity inside the greenhouse and nutritive content in the feed, as well as feed water concentrate & fertilizer. This process is free of all the disease and pollution. This technique of harvesting consumes 75-80% of feed by the proper use of feedwater concentrate & fertilizer. Hydroponic harvests are simple to preserve both outdoors and indoors and the crop has long duration shelf life. The hydroponics vegetables market is classified on the basis of vegetable type, distribution channel, and origin. On the basis of vegetable type, the market is classified into spinach, tomatoes, peppers, lettuce, cucumber, and others. In 2017, lettuce vegetable segment accounted for over 32.9% of the global hydroponic vegetable market. Moreover, the market is anticipated to show significant growth in the case of tomatoes, which is projected to register a CAGR of 9.6% over the forecast period. On the basis of the distribution channel, the global hydroponic vegetables market is categorized into unorganized small stores, grocery stores, hypermarket or a supermarket, whole food and specialty stores, distributors, bulk suppliers and others. Hypermarket or a supermarket division is anticipated to lead the global hydroponic vegetables market. On the basis of origin, the market is further bifurcated into the conventional segment and natural & organic segment. The conventional segment accounts for a relatively high revenue share over the forecast period. In terms of geography, Europe held the largest market for hydroponic vegetables in the world due to the advancement in greenhouse harvesting. The Asia Pacific accounted for the second largest share followed by Europe in 2017. Moreover, hydroponic vegetables market has huge opportunities in the emerging markets of the Middle East & Africa due to increased government spending on advanced agricultural technique & greenhouse in this region, especially in countries like Qatar and U.A.E. The key players in this industry are Hydrodynamics International, Inc, Greentech Agro, Llc, Argus Controls, BrightFarms and KUBO Greenhouse Projects, Thanet Earth, Pegasus Agritech, James Foskett farms, Valoya, Logiqs B.V, Village farms international, Hydrofarm, Inc., HortiMaX, Lumigrow, Inc., Koninklijke Philips NV, Heliospectra AB, General Hydroponics, Inc., Circle Fresh Farms and Growlife. Other players include Terra Tech., FormFlex, and American Hydroponics, Inc. among others.